Canon has upgraded two of its most loved and well-regarded L-series lenses with the launch of the EF 70-200mm f/4L IS II USM and EF 70-200mm f/2.8L IS III USM. The EF 7-200mm f/4L IS II USM is available from summer 2018 with an SRP of £1,299.99/€1,519.99 / £1,299.00 The EF 70-200mm f/2.8L IS III USM is available from summer 2018 with an SRP of £2,149.99/€2,499.99 / $2,099.00. The EF 70-200mm f/4L IS II USM’s f/4 constant aperture provides consistent exposure in a range of varying lighting scenarios. The nine blades on the EF 70-200mm f/4L IS II USM 's circular aperture create a pleasing bokeh effect, blurring the background and helping to accentuate the subject. 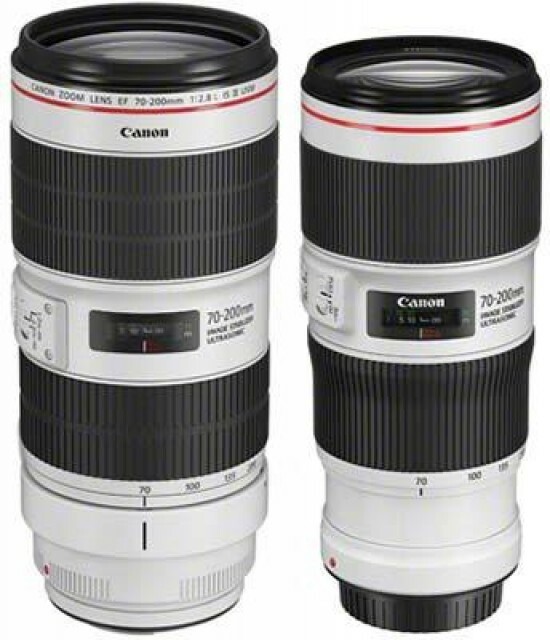 The EF 70-200mm f/4L IS II USM comprises a new Image Stabilizer unit, based on the design of Canon’s EF 100-400mm f/4.5-5.6L IS II USM, which delivers the equivalent effect of a shutter five-stops faster, compared to the previous lens' three-stops[i]. This is beneficial for any shooting scenario where the camera may be jostled, such as at film premieres, or shooting wildlife on safari.